Editor's note: CNN affiliates report on where job seekers are finding work across the country and how those looking for employment are coping with the situation. 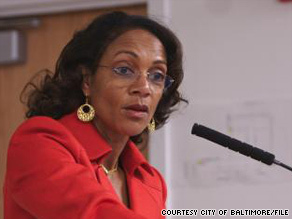 Baltimore Mayor Sheila Dixon, shown in April, once worked in a city jobs program as a youth. (CNN) -- Some of the stimulus money from the U.S. government is going to programs that help young adults find jobs. In Baltimore, Maryland, the city wants to put more than 7,000 to work, mostly in local government jobs. It will use more than $6 million from the federal government and sponsorship money, according to WBAL-TV in Baltimore. Baltimore Mayor Sheila Dixon recalled her days as a young worker. In Palm Beach Gardens, Florida, Kahtoya Wesley, 20, has had difficulty finding a job, but she has a better chance of finding work now because she has joined the Summer Youth Employment Program, according to WPBF-TV in West Palm Beach. The group also prepares the job seekers for interviews and provides seminars in how to deal with work-life situations. "I got fired like five times. It was bad," John Hill told WPBF. He chose a seminar on working better with a supervisor. The state of Arkansas is using federal money to fund jobs for at-risk students in Springdale, according to KHBS-TV in Fort Smith, Arkansas. The town's youth center hired five teens to work in clerical and maintenance positions, KHBS reported. David Cook told the station he has had trouble motivating himself to go to school. The summer job was helping him with a shift on focus. Even before a new FedEx shipping center brings hundreds of jobs to Troutdale, Oregon, it is helping with employment through road construction jobs, according to KPTV-TV in Portland. The new hub, which is expected to be completed in July 2010, will bring more than 1,000 additional cars to the area, so the Oregon Department of Transportation called for two additional lanes at a nearby major intersection, KPTV reported. FedEx is expected to employ 650 workers at the facility once it opens, according to KPTV. "We're creating family wage jobs, because this project will take place this summer," Troutdale Mayor Jim Kight told the station. He was once a senior loan officer who had been laid off and was looking every day for a job anywhere there might be an opportunity. When he couldn't find the right chance, he created his own. Kenneth Hodge is now a small business owner, the founder of SFG Records. "If you look at your failures, if you stare at your failures too long, you'll never go anywhere," Hodge told WPBF. "But if you look beyond your failures, you can move to and fulfill your dreams. You can do that. I think I can do that, and we are doing that." Federal stimulus money indirectly helped an air conditioning company bring 110 workers back to its plant in Marshalltown, Iowa, according to KCCI-TV in Des Moines. The town's economic development director told KCCI that Lennox was able to hire back the workers because of increased demand. "There's money from the federal level from tax rebates, and there's usually always money on the other side from the electric company helping out with tax rebates and most people are saying 'Yes, I want to do that,' " Joel Akason told the station. Twitter users can get updates about job fairs at the newly remodeled Hard Rock Hotel and Casino in Las Vegas, Nevada, KVVU-TV in Las Vegas reported. Wal-Mart's nationwide expansion brings 300 jobs to a new store in Charlotte, North Carolina, WSOC-TV in Charlotte reported.